If you have ever watched the anime, during the times when they did contests, they combined their Pokémon’s moves together to make cool looking move display to impress the Judges. That is what this art is trying to show, different Pokémon combining their abilities and moves. First up we have a Flareon that uses “Will-o-Wisp and Lava Plume” together to make a “firework” effect! For the second Pokémon, I am unsure on which Electric Pokémon it could be, the Pokémon has “prickly fur” from what the artist says in their description. The reason I picked this art is because of the 4th of July holiday just passed, and it’s celebrated with tons of Fireworks! So I thought, What If Pokémon created the fireworks instead of using man made types of fireworks? I looked it up and came up with this artwork! I hope you all enjoy this artwork as much as I do! It’s quite an amazing piece. So as all of you Pokéfan’s know it’s almost time for us all to set off on another adventure in the Unova region! Accompanying us upon the way are the choices of Starter Pokémon from the previous game. All around I am very pleased with this decision, because to be honest I love all three of them! So as you can see this week I bring you something you all should know of if you watched the animated trailer released a little over a month ago. If you haven’t seen the trailer yet go see it now at this link! I’ll wait, No seriously go view its awesomeness. So here’s Bianca holding the three starters that you can choose from! Get up now, Walk out the door, and head to your nearest video game stores that takes reservations and reserve it! Here’s a little something for the Pokémon/Yu-Gi-Oh! Fan’s out there. This artist combines the best of both worlds together in this amazing image! I’m not too big on the Yu-Gi-Oh side anymore but it seems there is a bunch of the main dragon type monsters there, along with their respective Pokémon counterparts. Another cool part about this image is that the artist posted their work along the way to the final completion. This looks like it took a lot of work and plenty of time to make into the final piece. I hope you all can look to appreciate this piece of work as I do! Some of you may have seen this Sketch floating around the Pokénet recently. So because of this I have decided to toss it up in the spotlight for Saturday Sketch! The color yellow, it can sure be pinpointed to a bunch of things we see in daily life. If you’re a student, you probably use a yellow #2 pencil, If you drive in a car the streetlights are yellow as caution to slow down, heck even the sun is yellow (well it looks yellow from where we can see). However the most important color yellow is used in is Pokémon. 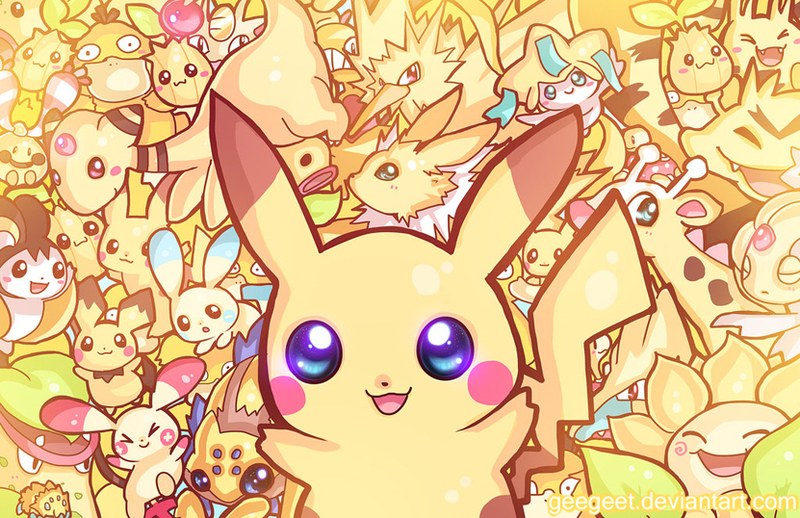 Throughout the years there have been many yellow Pokémon and the main one that almost anyone and everyone knows is Pikachu. “Who else would be featured but Pikachu.” Is what the artist says in the description of this. Along with “Yellow Party” there are other colors as well! According to the comments on deviantART, all of these prints that the artist brought with them to a convention were sold on the first day. These works are pretty amazing. I enjoy the Yellow Party mainly because of Jolteon. Tell me what you like about these works, I would love to know. You are looking for a Saturday Sketch? Well do I got one for you this week. ARE YOU ALL READY FOR BLACK 2 AND WHITE 2? Well good! Because you have a few more months if you’re not getting the Japanese imports. But to help tide you over till then, I’m going to bring you some fan art for this week’s sketch! So tell me, what do you know about Keldeo? Well with the speaking of Keldeo, that is what todays Saturday Sketch contains! It is titled Keldeo the Fourth Musketeer. I enjoy looking at this work, because the background fits very well with Keldeo’s colors. Being the smallest of the Musketeer Pokémon, Keldeo still stands tall ready to take on what is in its way! Keldeo is honestly my favorite out of the group, and I can’t wait to get my hands on one! So anyways that’s all I got for this week! Hope you all enjoy and I will catch you all next week! So, Welcome back to the beginning of June! Can you believe it’s been Six months since the beginning of the year already!? Only days closer to Black and White 2! But anyways enough on which we know what is coming, Let’s move on to Saturday Sketch! It’s more of the progress and amazing work that has been done on the Minecraft Server I host for the PKMNcast. Some amazing Pixel arts have shown up since the opening of the server a few months back. So today I would like to toss a few screenshots up in the spotlight! We got Glameow, and Politoed, made by Navy. With Starmie cloesly in the background made by Masietown. Scraggy made by Travis, and Zorua made by RKOVoices, Zekrom and Charmander by Masietown, The Groudon by Steven/Unggoy14. There are so many that have been made it is hard to count them all! So many amazing people have contributed to making this server look amazing! Well I hope you enjoyed this! I am amazed at the effort and time put into this all! If you would like to join, Follow @PKMNminecraft and the information for the server will be dispensed from there! How’s it going Pokéfans and Pokénerds? Welcome back for Saturday Sketch! This week I’m showing a sketch based of Mystery Dungeon! Recently I started to play Pokémon Mystery Dungeon Blue. This is the first time I have played it, and even though I haven’t really gotten far into the game yet it’s pretty enjoyable! It was made by =Arbok-X. Well why not venture into a cave filled with hundreds to upon thousands of them? Need a light to guide your way? Why not grab a Charmander Tail or use Cyndaquil’s back burner. Pikachu and Mudkip seem to be having a good time while everyone else seems frightened and a tad confused. Even though I do not understand the expressions from the two, it’s still pretty interesting to see expression in art. In particular I really enjoy Meowth holding Charmander’s tail as a protection/light device. Also Treeko is straight up Face palming. I wish I could describe the images meaning a bit more, however I still know nothing of Mystery Dungeon Lore. You should know what that means. If you don’t I will tell you! Time for the Weekly Saturday Sketch! This week in order to pick a Pokémon themed Sketch; I used a Random Pokémon Generator! If you don’t know what that is go “Here” and try it out. And the Lucky Pokémon this week ended up being Simisear! It is one of 3 elemental monkey Pokémon, with the other two being Simisage, and Simipour. It can only evolve once exposed to a stone of its type. But anyways, on to this Sketch. The Sketch I found actually consists of Pansear and Simisear. The Sketch is titled Fun Time Pokemon and was made by ~demetrix25 on deviantART. The sketch was drawn up and completed one month before the release of Black and White. It was drawn with pencil crayons and black ink! All around I think it looks pretty awesome! Even though I am not a fan of the Monkey’s in any way, this is a pretty awesome piece! I hope you enjoyed the sketch for this week. Cya all again next week! It’s that time again for another Saturday Sketch. So sit back and relax and give it your attention. It would be much appreciated if you do. Since the “Legendary Pokémon Darkrai” is being given out via Wi-Fi, I thought it would be fit to base Saturday Sketch on it this week! Here’s the Link! – Clicky. But anyways on to this week’s Sketch about Darkrai! This Darkrai was created and born in 2.5 hours using Photoshop. ~KidScribbles on deviantART created this “speed painting”. 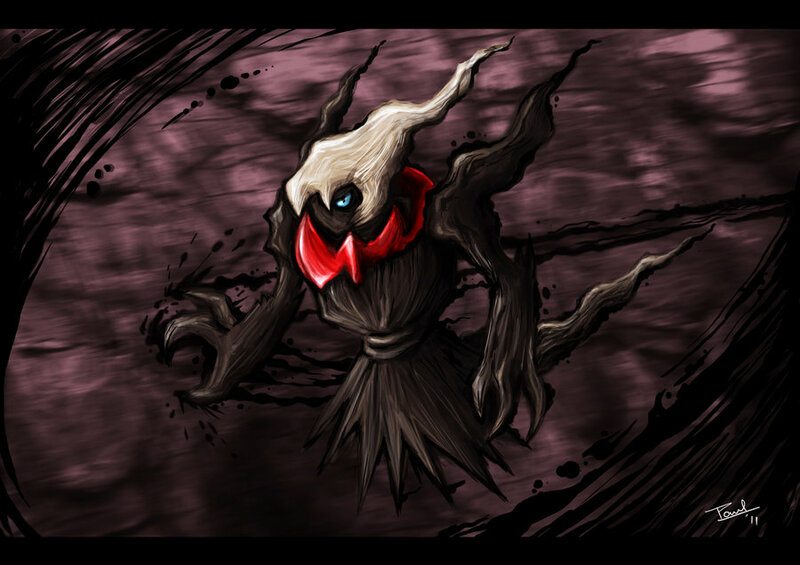 All around it’s pretty interesting; I enjoy the paint like features of Darkrai’s being. Hope you enjoyed this week’s Sketch. Be sure to get your Darkrai before time runs out! It’s Saturday again, so you know what that means! It’s time for another Saturday Sketch. But first I would like to say thanks if you read/view the Saturday Sketch every week. Honestly, I really do appreciate it! But you know what else is awesome? Because as you can see above that is this week’s Saturday Sketch! Everyone who is anyone knows that Haxorus is a pretty sweet Pokémon to use in the video games. However how about a Shiny Haxorus? The work in question is named Pokemon: Shiny Haxorus. It was drawn by ~mark331 of deviantART. He does some other Poké works on deviantART as well; you should really check them out. Anyways that’s all I got for these weeks Saturday Sketch. Hope you enjoyed it. This is Kay, Logging out!